PBA – The most awaited and one of the most exciting game that PBA fans want to see is the face off of Rain or Shine Elasto Painter and Star Hotshots. Both team was recently involved in a blockbuster trade between their franchise players that lead to a shocking reaction of many Philippine basketball fans. On October 13, 2016, the PBA 2x MVP and Star Hotshots franchise player James Yap was traded to Rain or Shine Elasto Painters in exchange for a ROS franchise player and point guard Paul Lee. The trade was unforeseen especially for James Yap who leads the team under the name of San Mig Super Coffee Mixers to a grand slam champion in 2013-2014 PBA Season and has won a total of 7 championship under the Purefoods franchise. Star Hotshots former teammate and friend Marc Pingris saddened by the news of Yap being traded. He thought that he, James and Peter Simon will retire together under Purefoods franchise. Pingris also provided some advice to James Yap departure. While Paul Lee, a superstar of his own is also the heart and soul of ROS, his departure with ROS is not also anticipated. Currently, James Yap is playing a great game with ROS, their team is currently tied in 1st place in PBA Standing with 3 wins and 1 loss, James was recently named Best Player of the Game in their last game after scoring 15 points against Black water Elite. Paul Lee, is also making his way as the new franchise player of Star Hotshots, their team has won their last two games and currently have 2 wins and 2 loss. Lee, was recently named as PBA Player of the Week. Tomorrow, December 18, 2016, Rain or Shine faces off Star Hotshots at the Smart Araneta Coliseum in the first games. 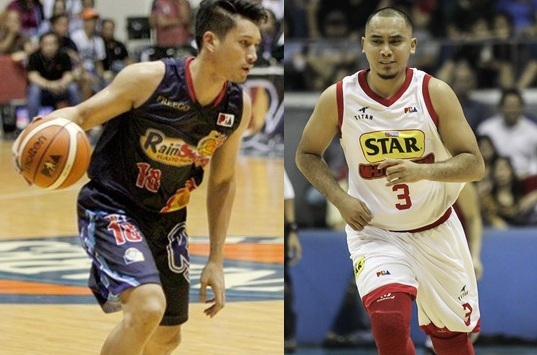 It's James Yap vs Star Hotshots and Paul Lee vs Rain or Shine. No Comment to " James Yap and Paul Lee Both Facing Their Former Team after Their Blockbuster Trade "